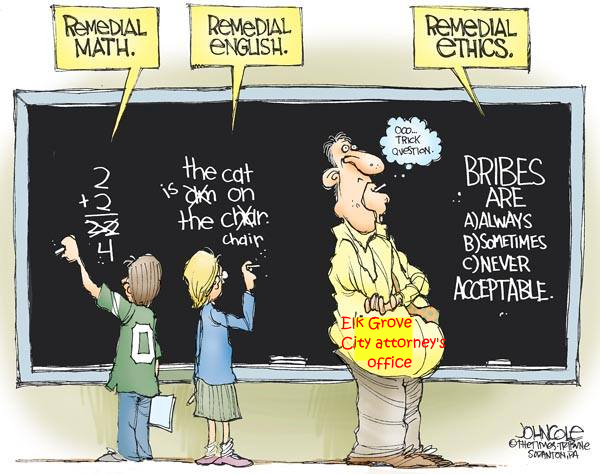 As required by law, employees of the City of Elk Grove have started filing their statements of economic interest with the city clerk's office. While most of the employees report not having taken any, several high-paid employees, particularly in the city's attorney's office, have routinely accepted gifts. The most egregious so far has been by a city public works department employee Brian J. Fragliao who accepted gifts that included six golf outings. Additionally, city attorney Jonathan Hobbs and his two staff attorneys, Jennifer Alves and Suzanne Kennedy, took numerous gifts, some of them from the city's primary outside legal counsel, Sacramento-based Kronick, Moskovitz, Tiedemann, and Girard, an entity where Hobbs' was once a partner. While the acceptance of gifts by public employees is not illegal, it does give the impression of impropriety, particularly when they come from vendors. Even though the Elk Grove City Council has never taken action on this, several California cities have addressed the issue. The most common action by these other entities has been to prohibit or limit the practice by employees in the interest of public integrity. Below are examples of ordinances that have been enacted to address the issue. Prohibition on acceptance of gifts and gratuities: The City’s policy on gifts and gratuities states “it is contrary to the City of Palo Alto’s ethical standards and merit system for any city employee to accept gifts or gratuities from any individual, business, or organization doing business, or seeking to do business, with the City or who is seeking permits or other entitlements from the City. It is the City’s policy to provide impartial and excellent customer service. To accept gifts can convey an appearance of favoritism and conflict of interest. Gifts can be perceived as attempts to influence City operations or as compensation for services rendered and can erode the public confidence in the impartiality of decisions made by City officials.” The policy cites as additional references: Gift limitations of the Political Reform Act of 1974, City of Palo Alto Merit System Rules and Regulations 1301, and the City of Palo Alto Purchasing Manual. City employees are prohibited from accepting gifts or gratuities from any outside source on an individual basis for individual use. It is permissible for departments to accept small gifts of food or candy provided that the gift can be consumed within a single working day and the gift is readily available to all employees in the department. These gifts cannot include alcoholic beverages or tobacco products. Existing City of Carson rules and regulations prohibit City employees from accepting any gift or gratuity from any supplier or potential supplier. Employees are not to accept any gift or gratuity from an individual, company or organization doing business with the City because gifts can be viewed as unethical attempts to influence City operations. Although some offers are made in good faith and intent, all employees are expected to remain free from any potential conflict of interest. Any gift offered by an outside party should be politely, but firmly, declined. The City of Elk Grove does not currently have any ordinance regarding this practice. This stuff is so confusing. Do ordinary citizens need to fill out a form if they received gifts? As a registered voter, I received a potted plant from Mayor Steve Ly and a potholder from Pat Hume a few years back. I can return the gifts, but the plant died and I sold my potholder on Ebay to a collector. Now I'm scared my boss might find out! It is just good governance for high-level decision-making city employees, with very high salaries and lucrative benefit packages, not to accept gifts, especially from the city's contractors, even when offered. The city of Elk Grove would be wise to adopt a similar policy as noted in the above cities. Let’s be reminded that the median salary for the Elk Grove resident paying these high salaries is $79,051 and the income per capita is $29,695, which includes all adults and children. Let's also be reminded years ago it was one citizen, Steve Lee, who came forward at public comment and Elk Grove News’ subsequent reporting regarding the Elk Grove City Council's double dipping of mileage reimbursement to regional board and commission meetings when they receive a nice per diem to cover such costs. More egregious, that double dipping also included billing the taxpayers for mileage to and from city hall from their home, not to mention luncheons while in their office at city hall. The Elk Grove City Council put a stop to double dipping as soon as it went public, adopting a new reimbursement policy. Will they follow suit here? Or better yet, will City Manager Laura Gill and/or City Attorney Jon Hobbs bring all of the of the high-level department heads together and "recommend" a new policy to the city council so that all city employees are viewed as being above reproach?